I am doing some experimentation with Node.js and would like to read a JSON object, either from a text file or a .js file (which is better??) into memory so that I can access that object quickly from code. I realize that there are things like Mongo, Alfred, etc out there, but that is not what I need right now. The easiest way I have found to do this is to just use require and the path to your JSON file. For example, suppose you have the following JSON file. and access all the elements of the JSON object. 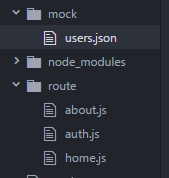 You can find all usage of Node.js at the File System docs! hope this help for you! Satyabrata Saha is a new contributor to this site. Take care in asking for clarification, commenting, and answering. Check out our Code of Conduct. // GET request for the /list_user page. How to make GET request with express.js to a local json file? How to read a json file in my node.js app? Efficient way to read JSON file?